The PLUS team will publish its first book in March 2009. 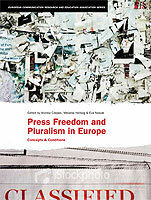 "Press Freedom and Pluralism in Europe. Concepts and Conditions" is edited by Andrea Czepek, Melanie Hellwig and Eva Nowak. The book is published by the European Communication Research and Education Association (ECREA) in its annual book series. "How free are the media in Europe? Freedom of the press and an independent media system are often taken for granted. All of the EU-member states today have implemented guarantees of press freedom in their constitutions and judicial systems. In Press Freedom and Pluralism in Europe, researchers from twelve countries examine media systems regarding conditions for independence and pluralism. They discuss a European approach to press freedom and diversity and include case studies of a broad spectrum of media systems." As a result of the first PLUS workshops, three articles by PLUS members were published by "epd-medien", a renowned German media journal, in 2007. The first article in April (April 25, 2007, issue No. 32) was written by Martina Thiele about the Austrian media system. In June (June 2, 2007 issue No. 42/43) the second article was published, written by Beata Klimkiewicz about the European debate of media pluralism. The third article in August (August 11, 2007, issue No. 63), written by Ingrid Schulze Schneider, dealt with the freedom of the Spanish press.